Will all the kids be impressed with how good Hank is at Table-Tennis? 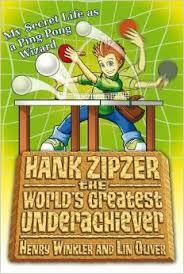 Hank Zipzer hates fifth grade already - and it's only his first day. Everyone has to pick a favourite sport, but Hank can't run, he can't catch and he can't throw. Luckily, he's a whizz at table tennis. This a sport, right?! Even Cookery Class is an adventure for Hank.